Welcome to the Friends of Durham 150 newsletter, designed to keep those interested in Durham’s 150th updated on planning. Welcome to the inaugural Friends of Durham 150 newsletter, designed to keep those interested in Durham’s Sesquicentennial updated on all the planning activities surrounding the yearlong event. Initially, we’ll update you every few weeks. That will likely expand to once a week when we are in the throes of activity in 2019. See instructions on unsubscribing if this is not relevant and please invite friends, neighbors and co-workers to subscribe (instructions at the bottom of this email). The City of Durham will celebrate its sesquicentennial in 2019, the 150th anniversary of its incorporation by the North Carolina General Assembly. Mayor Schewel convened a group of about 25 individuals in April to discuss the sesquicentennial. Many ideas were shared, and the mayor appointed a small convening committee to assess the possibilities and make recommendations, chaired by Shelly Green, President of the Durham Convention & Visitors Bureau (DCVB) and Patrick Mucklow, Executive Director of the Museum of Durham History. Other members include Beverly Thompson, Office of Public Affairs at the City of Durham; Eddie Davis, former City Council member and Durham’s Historian; Emily Egge, resident volunteer, in addition to Susan Amey, Chief Marketing Officer and Margaret Pentrack, Director of Content and PR, both with DCVB. The convening committee made a presentation on June 20th to members of the community interested in the Sesquicentennial, reporting out on the mission and vision for the Sesquicentennial, a proposed timeline, a visual identity, themes that would be covered by the celebration, a budget, and a very exciting idea for a closing event. That presentation can be viewed here. The Convening Committee is seeking an experienced project manager to oversee the events, activities and community engagement surrounding the Sesquicentennial. This is a part-time, time-limited position starting in September of 2018 and concluding in January of 2020. The incumbent will be employed by DCVB through an interlocal agreement with the City of Durham, anticipated to be executed this month. The job requires about 25-30 hours per week and requires nontraditional hours including nights and weekends. See the job description and apply here. 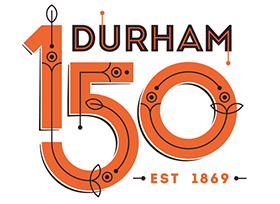 Kudos to Tobias Rose with Kompleks, designer of the Durham 150 logo. It’s symbolic of our tobacco roots but also reminiscent of a circuit board, signaling Durham’s innovation and technology. A little later we’ll tell you how and when organizations and individuals hosting Durham 150 events, projects and activations can use the logo. Finance – Develop policies and internal controls for managing the finances for Durham 150. Oversee monthly budgets, accounts payables, and accounts receivables, while ensuring compliance with policies and controls. Fund-raising – With guidance from a professionally written fund-raising plan and consultant, assist in soliciting $500,000 in private sector donations, sponsorships, foundation grants and other means of funding the efforts to carry out the Durham 150 events, celebrations and activations. Grants and Seed Money – Devise and implement a fair and inclusive process whereby residents and organizations interested in hosting Durham 150 events can apply for seed money to assist in implementing their projects. Develop an application and criteria for funding, solicit applications, and make funding recommendations to the Convening Committee. Communications – Determine and oversee effective information-sharing processes between the convening group, stakeholders, engaged community members, media, and other external news sources. Contribute expertise to develop a comprehensive communications strategy to increase national, regional, and local awareness of Durham 150. Historical Content – Develop programs and consult on how best to share the stories of Durham’s first 150 years. Help promote and preserve Durham’s historic resources and related events throughout the anniversary year. Opening Events Committee – Spearhead efforts to formally kick off the anniversary celebrations, bringing the community together. Tentative plans are to publicly unveil Durham 150 branding at the Holiday Parade on December 8, and for there to be a larger city-wide celebration planned around the actual anniversary in April 2019. Closing Event Celebration – Provide leadership for the event planning process, ensuring that the closing event reflects the mission and vision of Durham’s Sesquicentennial. Help organize creatives, stakeholders, and other event participants. Apply to one of these committees by expressing your interest and giving us some brief background here. Please forward this e-mail to friends, neighbors and co-workers who wish to receive updates on Durham 150. Better yet, send them this form. No longer interested in receiving these updates? Feel free to unsubscribe in the footer. You received this email because you are subscribed to emails from Durham Convention & Visitors Bureau. If you prefer not to receive emails from DCVB, you may unsubscribe from all future emails or set your email preferences.